I wonder how many people reading this blog have been stuck in a traffic jam? I know that I have. These days, I have first-hand experience that it can take an hour to do a Google-predicted ten-minute journey in Cork’s morning rush hour. But whatever their environmental strengths, Electric Vehicles (EV) will not solve that problem. In 1980, the year when Bob Marley made his only concert appearance in Ireland, there were about a million cars on Irish roads. Now there are over double that number with 99.9% of them powered by petrol, diesel or hybrid. That means just one in a thousand cars here in 2017 are pure plug-ins. This fraction is far lower than the original 2008 Government prediction/desire of one in ten by 2020, an amount, which has since been reduced to one in a hundred. The reasons why we should move from fossil-fuel vehicles to electric technology are well-known these days. Unfortunately, the recent RTÉ PrimeTime programme called “The Future is Electric” talked about the wrong one for Ireland: climate change. In this country the reason for ditching cars that run on petrol or diesel is for health reasons caused by air pollution not because of global warming. The electricity that drives EVs has to come from somewhere. Power stations need fuel and in Ireland that means almost entirely carbon-based sources. In other words, it is not just about the amount of carbon dioxide released directly into the atmosphere by conventional vehicle exhausts. The actual spreadsheet for transport emissions includes vehicle manufacture as well as fuel production and combustion contributions. Recent European Environment Agency figures show that cars powered by petrol or diesel give carbon dioxide releases, which are about the same as from EVs if the electricity to power them is generated by a typical mixture of gas, coal, nuclear and renewables. On the other hand, when the electricity generation results exclusively from coal-burning power stations then EVs are responsible for much more greenhouse gas production than “normal” cars. The real climate change advantages for EVs only arise if power generation results entirely from renewables like solar and wind. Then the total CO2 release for EVs is about one third of that from conventional cars. About 50% of the energy generated in the UK is from renewables. In Ireland it is about 10%. Yes that means 90% of our energy requirements are based on fossil fuels. Currently then, climate change advantages to justify EV usage in Ireland are negligible. That is the point the Prime Time programme failed to grasp. What they should have pushed was the real health advantages EV provide by not emitting nitrogen dioxide roadside and because they release much less particulate matter (PM). The list of ailments and diseases attributed to these two types of air pollutants increases every day: cardio, cancer, diabetes, dementia, kidney failure are just those I have read about this week. There are no PM exhaust emissions from EVs, although they do have tyres and brake pads and so there will be some solid material released from them. In this respect, they are no different from conventional cars, trucks and buses. But because the combustion process to power EVs originates from remote power stations, the air pollutants released can be scrubbed out or become dispersed and diluted well away from pedestrians or drivers. Go Electric then? Yes we should but there will be financial implications. Under the current taxation model the Government will take a hit running into billions of euro every year with revenue lost on petrol and diesel sales. One way of filling the gap is to charge a road-use distance tax that will be assessed from the installation of a microchip in your EV with data downloaded each year. There may be no alternative to that approach once fully solar-charged vehicles requiring no centrally generated electricity are available. And they will be. 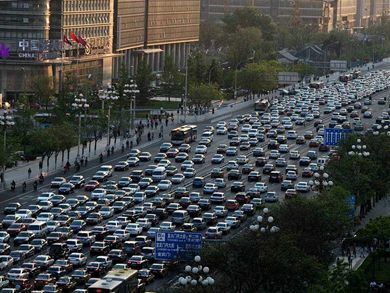 With or without EVs we will remain trapped in traffic jams unless local Irish road management and public transportation systems improve dramatically. It is not in a good state at the moment, especially in Galway City where drivers spend 17% of their driving time in traffic congestion. This figure is far worse than the percentages calculated for London (13%), Los Angeles (13%), Paris (13%), Dublin (10%) and Cork (8%). At least it is better than Bogota (32%). The worst aspect of the traffic congestion problem in Galway City though is that it currently has no real-time air monitoring being performed at all by the local Council. Therefore, drivers, bicyclists and pedestrians there cannot make informed choices about potential health effects, especially if they are at-risk, like asthmatics. Get a grip, Galway. At least with EV transport the climate change and air pollution problems we face have a chance of being eliminated. In fact, I’m confident that every little thing gonna be alright.